We traveled outside the Jakarta Province, we headed south to Bumi Serpong Damai -BSD City, where BSD City an Independent City located. BSD City Big City Big Opportunity. 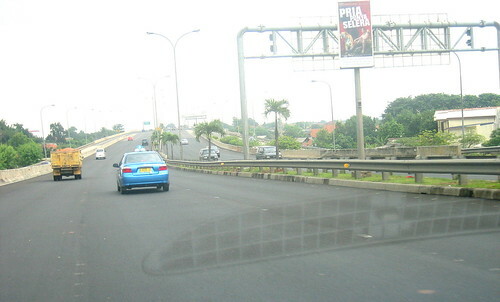 Actually BSD city is inside the Greater of Jakarta which are called JABODETABEK, consists of Central Jakarta city, North Jakarta city, West Jakarta city, East Jakarta city, South Jakarta city, Bogor city and Bogor Region, Depok city, Tangerang Region and Tangerang city, Bekasi Region and Bekasi city. BSD City is a new satellite city about 20 kilometers from Cilandak Town Square -CITOS at South Jakarta, it connected with toll road at the outer ring road Taman Mini Indonesia Indah -Beautiful Indonesian Miniatur Parks at East Jakarta to Pondok Indah at South Jakarta. BSD City was planned as a self service city located in Tangerang Regions, Province of Banten, adjacent to South Jakarta. BSD City supported by some schools Al Azhar, Switzerland Germany University,St Marry College,St Laurencia. BSD City supported by some banks Bank Central Asia, Bank Mandiri, Bank Danamon, Bank Bumi Putera, Bank Rakyat Indonesia, Bank BNI. Hospital around BSD City are International Omni Hospital, another International Hospital is under construction near Swiss German University. BSD City has a Market Place or they called it Pasar Modern, the design of this market reminded me to Queen Victoria Market in Melbourne,Victoria,Australia. In this market you can buy vegetables, fruits, fish, chickens, meats, foods, cakes, breads or even cloths, housing appliance. BSD City housed some housing estates like De Latinos, The Greens, The Pavilions, Villa Melati Mas, Melati Regency, Alam Sutera. Although the name of the residence clusters like in the west but here has warm weather, different than Melbourne at the State of Victoria Australia. BSD City has some shopping malls like International Trade Center (ITC), BSD Junction, World Trade Center (WTC), Serpong Plaza, so the economics are grow up as their motto BSD City Big City Big Opportunity, and Water Park recreation area. 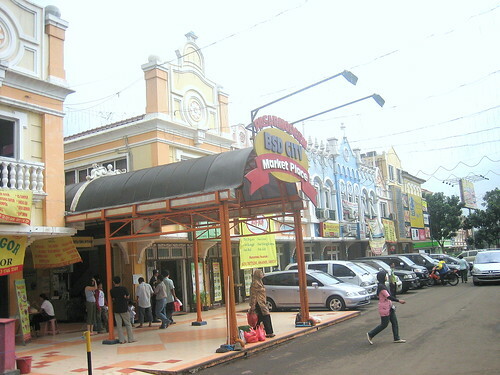 In BSD City there are a lot of restaurants with variety of foods from the village menu up to the international menu . From fine cuisine up to junk foods, there are Pizza Hut, the Sarpinos pizza, Mc Donald, Kentucky fried chickens. You could drink a lot of variety of Ice Cream, yummy..yummy. This time I would like to show you the village menu, this Cafe is located at BSD City Market Place. Yummy Soto mie Bogor Bogor Noodle Soup, sotomie Bogor yummy or enak in Bahasa. Bogor is a small city southern Jakarta with high rains intensity, that is why Bogor so called Rainy City or Kota Hujan in Bahasa Indonesia. This cafe was designed like a pedestrian cafe, they have some menus beside Bogor Soto Mie, Ribbs soup, fried chickens, fried rice,gado-gado -vegetables salad with peanut sauce, karedok -raw vegetables with peanut sauce, oxtail soup. Inside the cafe you may see some pictures of the owner brothers who is an Indonesian Actor, hold a black belt of Japanese Martial Arts Judo, I think he is an instructor of self defense at the Army Command. Soto Mie Bogor recipes consists of Yellow noddle, white noddle, potato, onion, meats, crackers, tomato, herbs. You may add some red pepper, ketchup, citrus lemon, it is yummy. 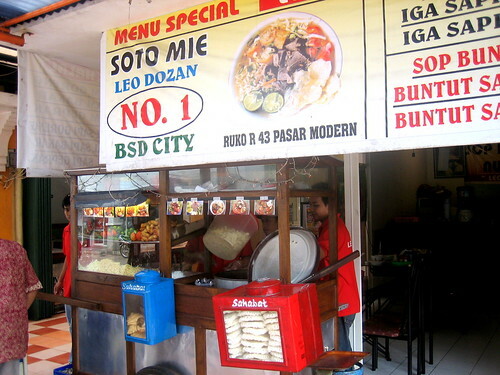 Soto Mie Bogor relatively cheaps, the price only one US Dollar per bowl, so why don’t try this kind of foods. If you don’t like this kind of foods you may try Padang Foods (Hot foods), Chinese Foods or Western Foods.